I have provided the executive summary here, the full report can be accessed by all through a link at the end of this blog. In 2017, a healthy holiday season provided great relief for weary retailers. A strong economy lifted all, proving that traditional retail is not dead. People still shop, but their buying behaviors and lifestyle choices are changing. Amazon is not the asteroid that struck planet retail. Competitive pressures from disruptive, pure-play e-commerce players and new physical retailing models are causing radical changes to antiquated business models, driving down prices and driving up costs. Retailers are rightfully concerned about how to accomplish the herculean task of transforming a traditional, multichannel retailer into a digitally enabled provider of unified retail commerce. For the second time we asked participants to indicate where their organization is placed on a scale ranging from having no digital strategy to harvesting results. The figure below compares the responses from this year and last and incorporates the results from Gartner’s 2018 CIO Survey, showing that there is a fairly consistent trend, but a slow march toward scaling and ultimately harvesting results. 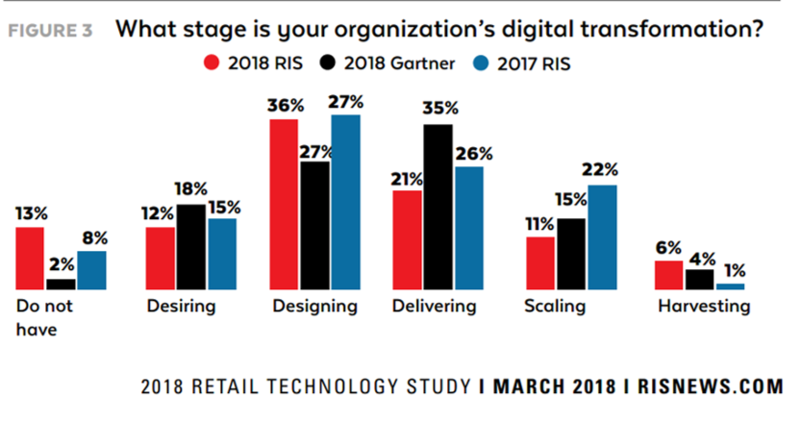 Results from the RIS News and the Gartner survey continue to show that retailers are having difficulty shepherding digital transformation into digital business opportunities. The term “digital business” encompasses a broader business opportunity that is not focused primarily on an element of technology — for example, online technologies. Rather, it refers to the emerging trend of organizations creating new and innovative business designs by blurring the physical and digital worlds. A leading-edge digital business will include connection or integration with assets (businesses, people and things) beyond the control of any one company. Digital businesses will, therefore, redefine traditional industry and market boundaries, and they will drive change toward new and unprecedented business environments — led by customers and characterized by industry fluidity. Collaboration is key — retailers must build ecosystems that include other retailers; businesses from other industries, such as consumer goods; and customers and tech vendors. 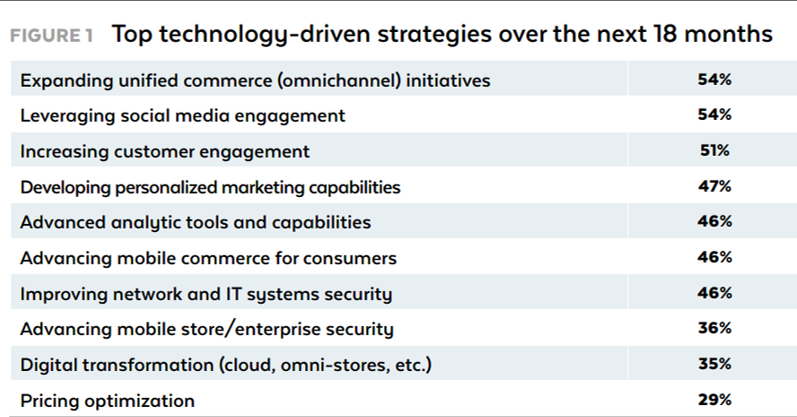 The figure below outlines the key technology driven strategies retailers are focused on over the next 18 months. To combat market share erosion and take advantage of the opportunities offered by digital, multichannel retailers need to recognize that their extensive network of stores can be part of an effective, unified commerce strategy. Expanding unified commerce initiatives takes the number one spot with 53% of survey respondents. Browse — Enables customers to find what they need, as well as discover new and different products and services that will enhance their lifestyles. Provided by stores and online channels, as well as mobile, social, IoT-enabled devices, AI and augmented reality working together to deliver an immersive shopping experience. Transact — Enables a seamless capability for the customer to transact within and across channels, regardless of the product or the combination of products and services, without inconvenience or delays. Provided through modern, interconnected POS applications, mobile applications and the excellent customer-facing execution of processes. Acquire — Enables the customer to acquire goods and services with a variety of methods, including physical shopping, click and collect, in-home delivery, automated replenishment, and lockers, as well as partnerships with external organizations. This is provided by executing highly flexible fulfillment models, including traditional, in-store shopping and many last-mile delivery options. Consume — Enables customers’ enjoyment and enhances their consumption experience. Provided through enhanced information and services, connected devices, autoreplenishment, and voice-enabled interactions. The intersection of these four customer processes is the focal point of a customer-centric experience. Unified commerce involves understanding how customers are using technology in their everyday living, then deploying technology that makes their lives simpler, better, easier and safer. Unified commerce demands that retailers of all types engage in digital business transformation built on a foundation of customer understanding. 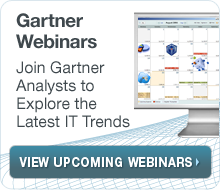 There are significant obstacles faced by all retailers as they seek this transformation. 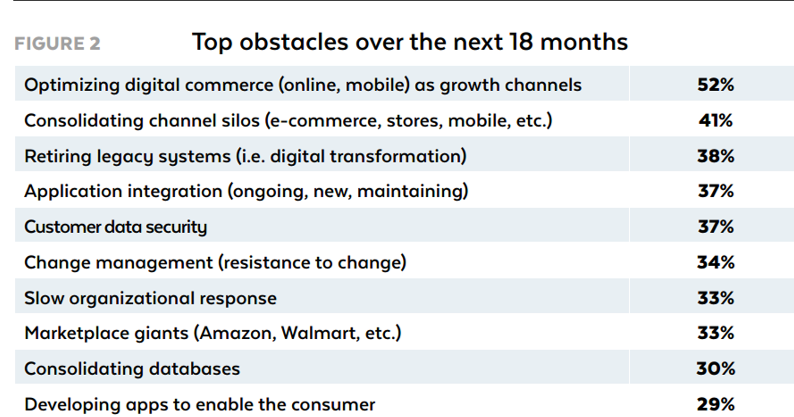 The figure below shows that 52% indicated optimizing digital commerce is the number one obstacle. Cultural issues are much more pervasive and elusive, but they must be addressed head on for the retailer to survive and to thrive. Ensure that all senior management has a consistent vision for the future organization, can articulate that vision, and reinforces why digital transformation is critical. Initiate digital business education programs to improve readiness and drive change management to ensure all associates understand their role in shepherding digital business transformation. 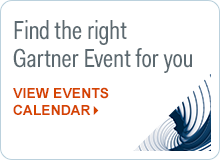 Use your seat at the table to demonstrate knowledge of new technologies and how they can support digital business use cases.